...the owls will come out tonight! Or tomorrow, at the very latest. The actual pattern is more or less complete! 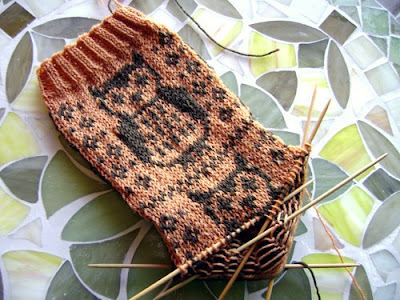 Progress continues on the actual sock. Once it's finished and proper pictures are taken, I'll release the owls. March 20, 2009 at 11:30 a.m. I totally love these! I need a pair of owl knee-highs for sure!! March 20, 2009 at 12:55 p.m.